Finding an inexpensive and flexible flooring material to meet all these needs can be a challenge. 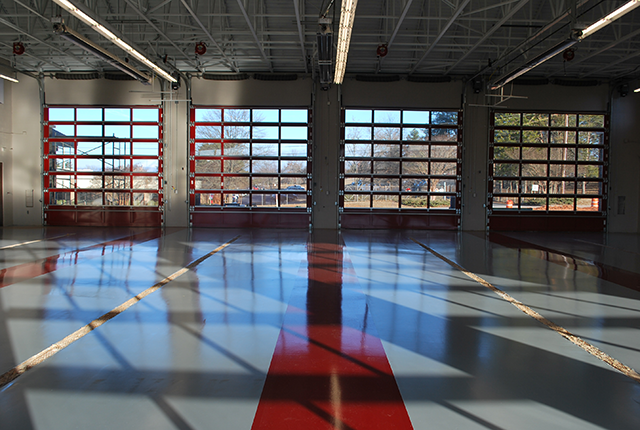 Concrete is preferred for firehouse and police station flooring because it is durable and easy to maintain. The epoxy coating or polishing technique used to protect the floors makes all the difference. Epoxy coatings for concrete floors can withstand years of hard use while maintaining natural beauty and luster. Epoxy flooring is resistant to spills and stains. Water and other liquids sit on the surface of the floor without soaking into the concrete beneath. Epoxy coatings are also simple to clean, requiring no special equipment or cleaning materials. In public safety buildings where spills may be common–especially in the training room–easy maintenance is especially important. Epoxy coatings specially formulated to resist corrosive or hazardous chemicals provide ultimate protection for concrete flooring, increasing the lifespan of the floor itself and reducing maintenance costs. This frees up money to be put back into the safety and protection of the public. Epoxy coatings can increase the reflective quality of indoor lighting by up to 300%. This increase in visibility can reduce accidents like slips, trips, and falls. This is critical in settings where workers may be undergoing intensive physical training or leaving quickly to handle emergency situations. Colored epoxy makes it possible to create different work zones. This is important for buildings where specific areas may be designated for vehicle storage, worker traffic, administration, and training. Colored sections of the ground show employees where it’s safe to walk and where it’s not, reducing accidents and safety violations. Public money should be stretched as far as it can safely go. This means that fire departments and police stations should seek out the most affordable flooring options. Epoxy coatings and concrete polishing options are both affordable and durable, allowing the client to make the most of their money. Epoxy coatings and industrial flooring options can be formulated to be impact resistant and slip resistant. These qualities help epoxy flooring improve the safety and quality of life of employees while on department grounds. For more information about how your public safety agency can benefit from epoxy coating or concrete polishing, contact Liquid Floors today for a free consultation.